It’s my birthday. There, I said it. And I’m not even ashamed to tell you how old I am (31), although my mom might wish that I hadn’t. And although, obviously, I’m getting older, I feel a bit like I’m getting younger this year. I’m not really one for New Year’s resolutions, but birthday resolutions seem like a better approach. Another year of me… what will I do with it? Keep discovering my purpose and living it every day. Take the time I need for self care and inner reflection, every day. And do a better job of listening to my inner teacher. Raise $20,000 for sustainable relief efforts in Haiti and travel there next year to put words into action. Connect more with my community, those I know and those I don’t. Meet new people, every day. So there you have it. Just a few small items to start with for my new year. It’s not surprising, though, that most of the things on this list make me feel younger just thinking about them. That’s the great thing about birthdays – you can take what you need from them. And this year, I need to know that the sky’s the limit. Here’s to big dreams, new adventures, and starting right now. I live just outside of a major city, drive my (hybrid) car nearly every day, and generally live what could be considered a modern, urban lifestyle. But I have committed in a few small ways to staying connected with the rhythms of the earth, despite the flow of life in the twenty-first century. A couple of years ago when we purchased our house, we decided to uproot most of the grass in our backyard and replace it with wooden frames filled with rich, dark soil. With a few gardening books, some basic tools, and a lot of sweat, tears, and lessons learned, we have managed to grow a bounty of greens, carrots, beets, radishes, cucumbers, tomatoes, beans, and more. Believe me, you don’t really know what a carrot tastes like until you pull one out of the ground, brush it off, and take a bite. It’s heaven. But for me, what’s more important than a handful (or sometimes, on a good day in July, a bowlful) of fresh food is the opportunity to connect so intimately with the ground – the earth – and its sustenance. When as part of our modern flow, we can simply grab a bag of dirt-free, pre-carved carrots or a bright red tomato when it’s snowing or – the horror – asparagus in September, it’s hard to stop and remember how the whole process is supposed to work. It’s an incredible exercise in mindfulness. And I really like getting dirty! I adopted a tradition a few years back related to asparagus in particular. It’s unquestionably one of my favorite vegetables, and it’s characteristics make it the holy grail for me. It shoots out of the ground in mid-April and appears for maybe six fleeting weeks at our Saturday morning farmers market. And with few exceptions, this is the only time we eat it – and we eat it voraciously. This past weekend, as we walked into the market in a cold drizzle, there they were – the first beautiful green bunches. I bought two big round bunches and we sunk our teeth in last night. It was heaven. Admittedly I buy lemons, bananas, avocados, and some other decidedly non-local produce throughout the year. But there’s something magical about a vegetable that’s not supposed to grow except for during this very brief period, and the rest of the time is forced out of the ground in the southern hemisphere and flown many thousands of miles to reach my grocery store. It just wouldn’t be as delicious in April if you could eat it all the time, and so I choose to only eat it when the earth tells me I should. I don’t think I’ve ever met anyone who thinks about vegetables as much as I do. Maybe you never find yourself contemplating mindfulness in the context of asparagus, and that’s fine. But I invite you to find yourself a little bit of dirt, even if it’s just a pot, dig your hands around in the soil, and learn something about how the food you eat grows (by the way, you can’t grow asparagus in a pot, and even if you plant it in the ground, it takes three whole season before it produces any edible shoots). Even if you can’t grow your own food, go out and meet some farmers. And set an intention to be a bit more mindful about what ends up on your plate and how it got there. I have lots more to share on this topic, so stay tuned for reports from the backyard garden and the role of carrots in my daily practice of yoga. In the meantime, if you do head out to the farmers market and pick up some asparagus (DC folks, now’s the time! ), here’s my recommendation for cooking it. Hold one of the asparagus stalks firmly and snap off the thick woody end – it will tell you where to break it. Repeat with the whole bunch. Brush the spears with olive oil. Sprinkle with salt and pepper. Grill on an outdoor grill until lightly charred. Alternatively, you can roast in the oven on a nonstick baking sheet at 400 degrees for about 20 minutes, or until tender but still crisp. Serve immediately. Savor every bite while it lasts! My yoga practice is a work in progress. For me, the most important foundation of this practice is being yoga. Sounds easy, right? Wrong. This is also the part of my yoga practice I am least likely to perfect in this lifetime, no matter how many times I come into handstand or hanumanasana, no matter how many deep breaths I take. These things help, of course. But being yoga – off of my eco-friendly rubber mat and out of the serene setting of a yoga studio – is so much more. Being yoga means awakening fully to our inner wisdom – that all-knowing divine teacher within. When you find this guide, you become more attuned to others and the world around you, the impact of your every step, and the ways in which we are all connected. There is no other, there is just “we.” And every breath I take affects the breath of my neighbor next door as well as my neighbor on another continent, worlds away from my daily existence. This is a bit of a scary proposition, I know. You’re probably thinking, I can hardly worry about myself and what I’m going to eat for lunch today. How do you expect me to think about the impact of every decision on every other human being on the planet (there are nearly 7 billion of them, by the way), let alone trillions of animals, plants, and the earth itself? It’s just too much. This blog marks the beginning of an old yet new journey for me. Over the next 8 months, I will work with committed people in my community of friends, yogis, activists, and citizens to raise at least $20,000 as part of Off the Mat, Into the World’s Global Seva Challenge. 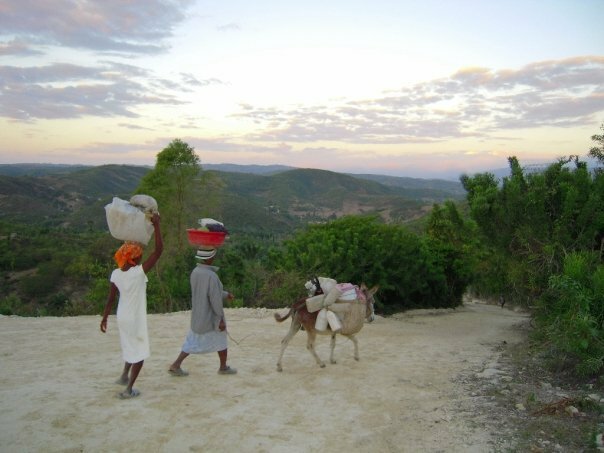 If I succeed, I will have the opportunity to travel to Haiti early next year to put seva – conscious, spiritual, selfless service – into action. OTM’s challenge is an extraordinary chance to help the people of Haiti, working with grassroots organizations on the ground to help rebuild that country in a sustainable way. But I am also not ashamed to admit, this is an incredible moment that the universe has set before me, to practice yoga in a new way with each breath I take for the next 11 months. There will be opportunities for very practical experiences – overcoming obstacles to make large fundraising events come to life, regaining some of my forgotten french-speaking skills, learning about the history and culture of a troubled yet vibrant country. But there will also be countless occasions to step back and consider the impact of my own suburban yogi lifestyle on people I have never met but with whom my existence is inextricably intertwined. There is a lot more than money standing between me and this trip of lifetimes. I fully expect to face down my own fears and demons on a daily basis, whether manifested from within or in the voices of others. But I’m armed with love and community and ready for whatever lies ahead. There will be a lot of yoga, and a lot of breaths, between here and there. Please visit this space for much more about my journey to Haiti, as well as musings on yoga and living awake through a mindful and sustainable lifestyle.